The Point: Check your vehicle today to see if your airbag is defective and eligible for free repair. As part of its mission to promote safety on Riverside County roads, RCTC is partnering with the Southern California Airbag Recall campaign to ask drivers to check their vehicles for defective airbags. Tens of millions of vehicles with Takata airbags are vulnerable to deadly ruptures that could spray metal shrapnel into drivers and passengers, prompting the largest safety recall in U.S. history. 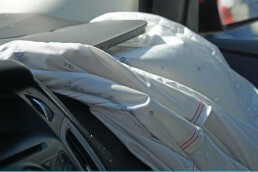 RCTC is helping inform vehicle owners of their potential need for free airbag replacements in multiple ways. Airbag Recall volunteers will be deployed at RCTC’s nine rail stations in Jurupa Valley, Corona, Riverside, Moreno Valley, and Perris where thousands of Metrolink riders park their cars. RCTC will also be reaching out to major Riverside County employers through its Commuter Assistance program, as well as providing information on social media such as Facebook and Twitter. Sadly, the most recent fatality due to a defective Takata airbag occurred in Riverside County. Please protect you and your family by visiting the Airbag Recall website and input your license plate or VIN number to check if your vehicle is subject to the recall. You may also call 1.888.234.2138 to get more information. Over 1 million airbags in Southern California from 19 automakers are covered by the recall. Repairs are free. 2001-2003 Hondas pose the most urgent threat; free towing is available to drivers of these higher-risk vehicles. RCTC is pleased to partner with the National Highway Traffic Safety Administration, along with the Riverside Police Department, California Highway Patrol, and many other community partners to keep our residents safe on the road.